Lubomyr T. Romankiw celebrated his 87th birthday on April 18. The Ukrainian, who invented recording information on a hard disk’s magnetic head almost half a century (49 years) ago, thus ushering in the era of personal computers, still works at IBM. The longtime scientific career and work at IBM brought him to the National Inventor’s Hall of Fame, where the portrait of the Ukrainian is next to those of other inventors, including Steve Jobs. However, Romankiw’s colleagues are somewhat dissatisfied with comparing him to the latter. They claim that, hadn’t it been for Romankiw, Jobs would have stood no chances to achieve international fame. He still does not have a computer of his own at home: he says the machine would be taking all his free time. “Some may regard this as a whim of an IBM whiz who invented magnetic heads, but who doesn’t have a PC. In fact, I’m looking forward to the time when PC can be linked to the brain, so fresh data can be downloaded while you are asleep. Then I’ll take that button and put it in my ear,” Romankiw told The Day half-jokingly. Then he said he had already patented this idea in the US. 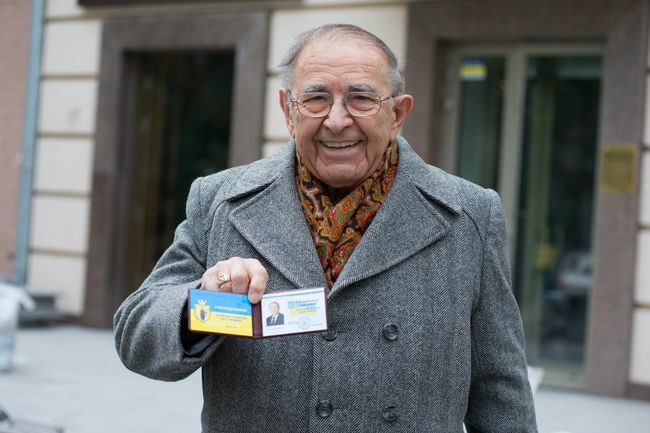 Romankiw has been living abroad for 70 years and has Canadian citizenship, but he calls Ukraine the most important country for him. The researcher confesses that he reads the Ukrainian press every night, and if the news is bad he cannot fall asleep for a long time. Lubomyr last visited Ukraine almost five years ago. At the time, in October 2013, he was granted the status of an honorary citizen of Zhovkva, where he was born and lived until 1944, when his parents and he ran away from war to Munich. Quotations from the exclusive interview he gave then to The Day still go viral in the Web. Although the world seems to be changing at breathtaking speed, the material written five years ago is still fresh and topical.